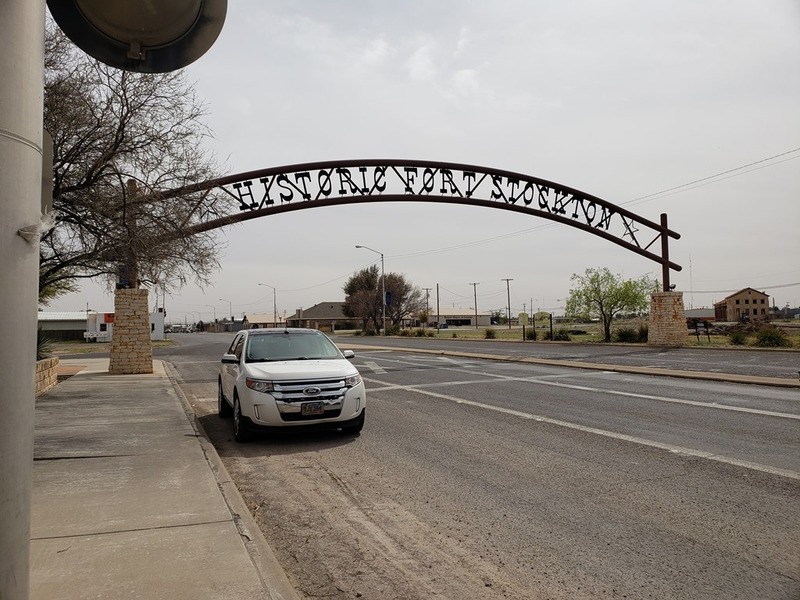 Saturday- We left Mission RV Park around 9AM and continued east on I-10. The roads are awful! Really bumpy. 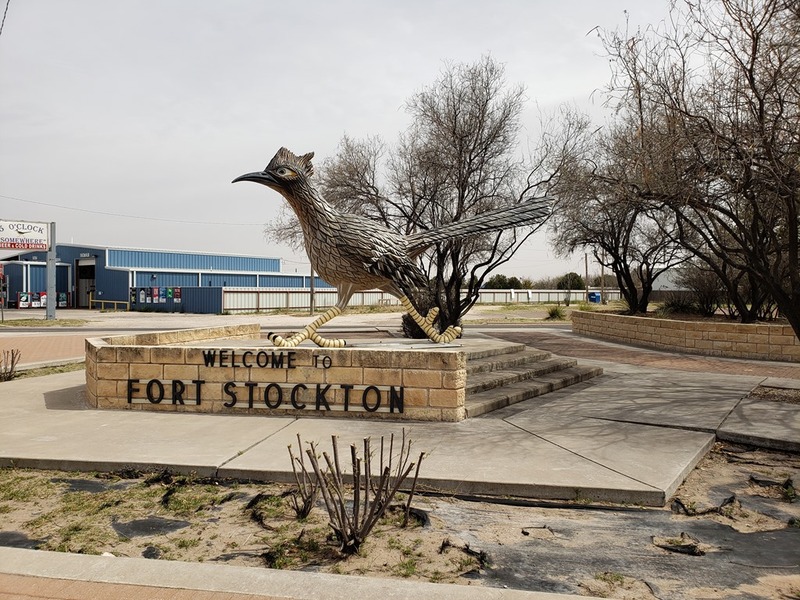 The winds started picking up just as we arrived in Ft. Stockton. 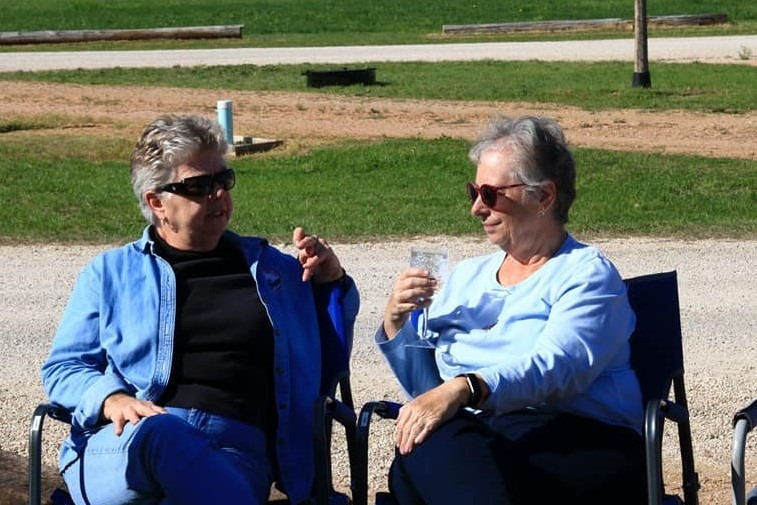 We were glad to be parked at Hill Top RV Park. The park opens at 3 pm, and we arrived at 2. There was a pedestal with a top to open, and inside I found my name with an envelope. I completed the information, added $27 dollars in cash( FHU 50 amp), and put it through the slot into the office. Then we parked in site 41, which had the side of the RV facing west. There was quite a view from the hilltop, but the wind was really blowing and there was a lot of flying dust. 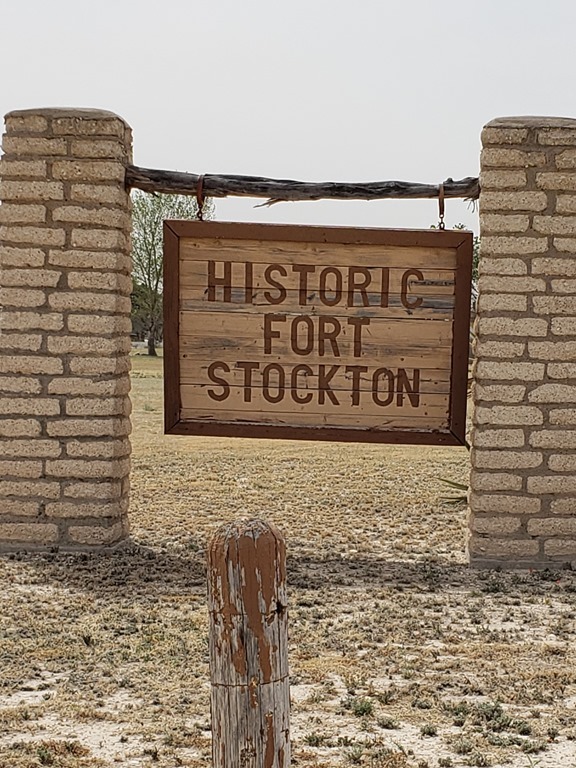 After setting up, we walked the dogs and went into Ft. Stockton. We saw this sign over Main Street. Something was going on downtown, as there was a road block and lots of tables and chairs in the middle of the street, with caterers setting up. 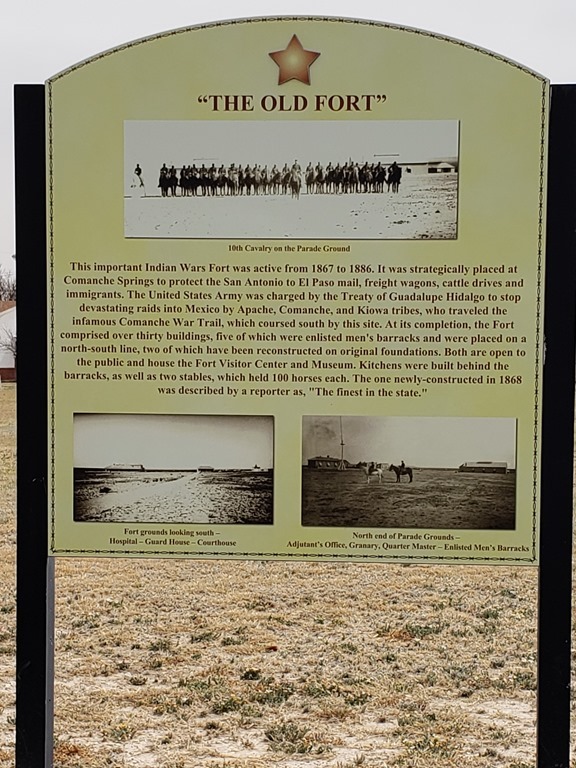 We went around the block, finding the historic fort. They need to do some work on this, as the buildings were falling apart. We did just drove by. and looked at the 1909 Hotel. 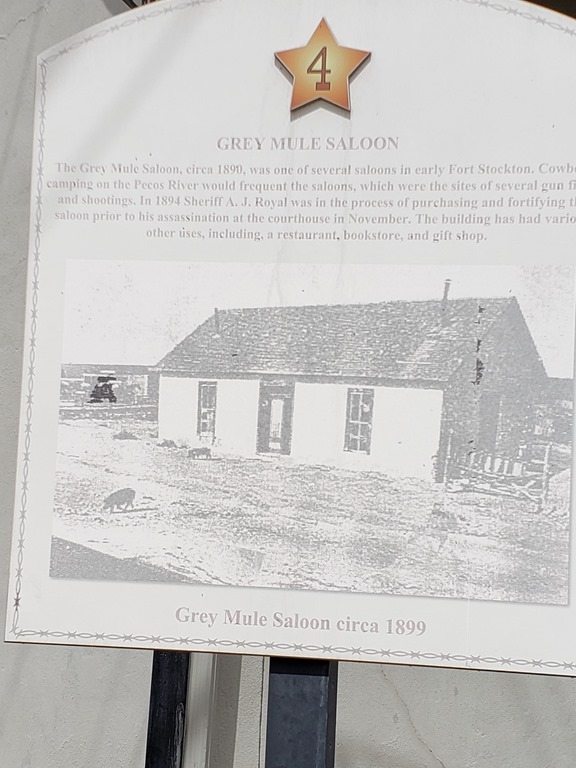 Across the street was the Gray Mule Saloon. which was a tasting room. So we went in. The only wine I wanted to taste, was the Moscato, and you had to purchase a whole bottle. We left and went to visit the Roadrunner Statue. We stopped at Walmart for gas and bread, as the gas was the least expensive in town @ $2.63 gal. 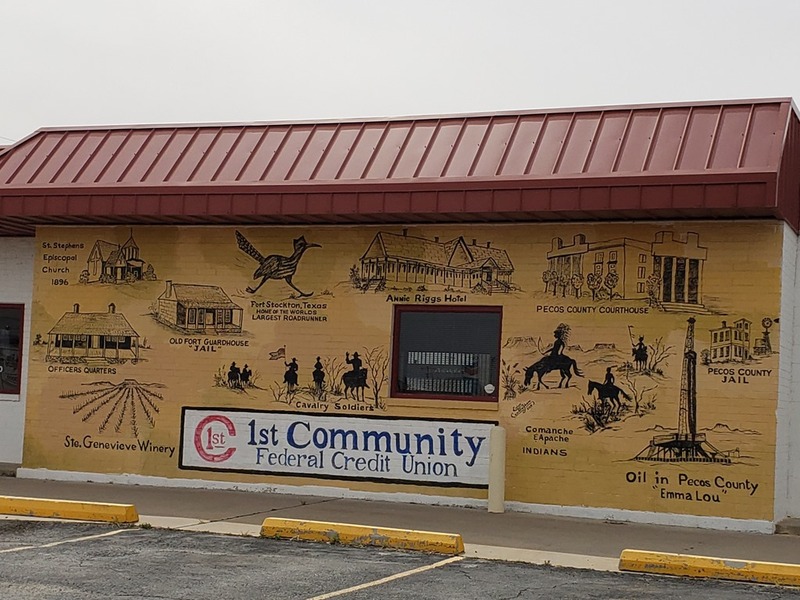 We saw this mural on the side of a bank. We returned to the rig, and this is what we found! I had to keep from laughing. Bob had stopped on the way in and came in after me and he also had to stop from laughing! We just rolled it back up and went on with life… We walked the dogs again, ate dinner, and watched TV. When we went to bed, the rig was rocking from the wind. Sunday- The wind had died down overnight, thank goodness! We walked the dogs and Roxie and Koda played in the dog run. We packed up and left at around 9:30. We continued east on I-10. We stopped for lunch at a rest area. The rest area sign was at the exit, but once we arrived at the end of the ramp, there were no further signs. I saw two flags, so we went there, and sure enough it was the Visitor Center and rest area. We saw lots of lost RV’s drive by…. We were both freezing at this point. I had been driving and Bob had put his jacket on. I ran back and grabbed a fleece to wear. We ate lunch, and continued on I-10 east bound. Whew, it was cold outside, but the wind was less than it had been. We eventually stopped for diesel at a Pilot, then turned onto Hwy. 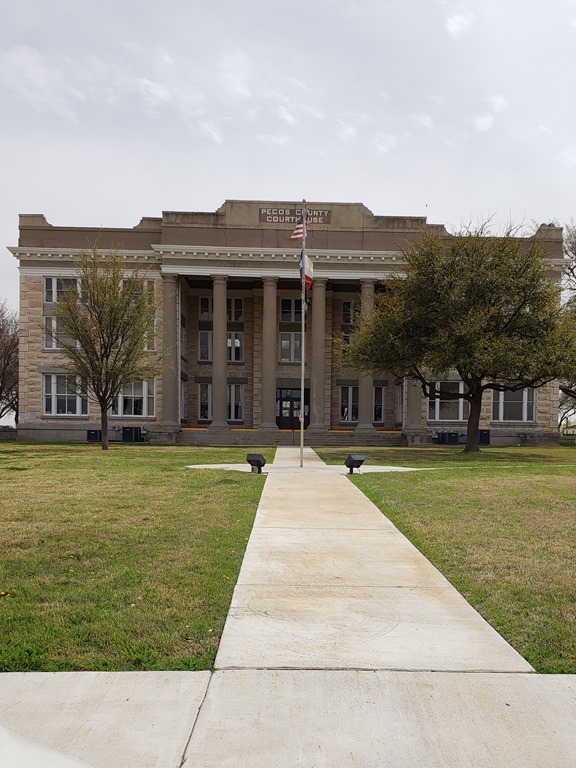 290 and drove about 30 miles to Fredericksburg. We arrived at the park, signed in and Susan met us. After hugs, we introduced her to Koda. She greeted all the dogs, and showed us that there are dandelions in each of the sites and on the common grass. These dandelions have stickers and some are sticky. Bob used a tool to get all the dandelions up and put them into one of the fire pits for them to be set on fire, eventually. We set up and at 4 PM there was a spontaneous happy hour. Everyone just showed up at the Wagon Masters site. Lots of hello’s and hugs. 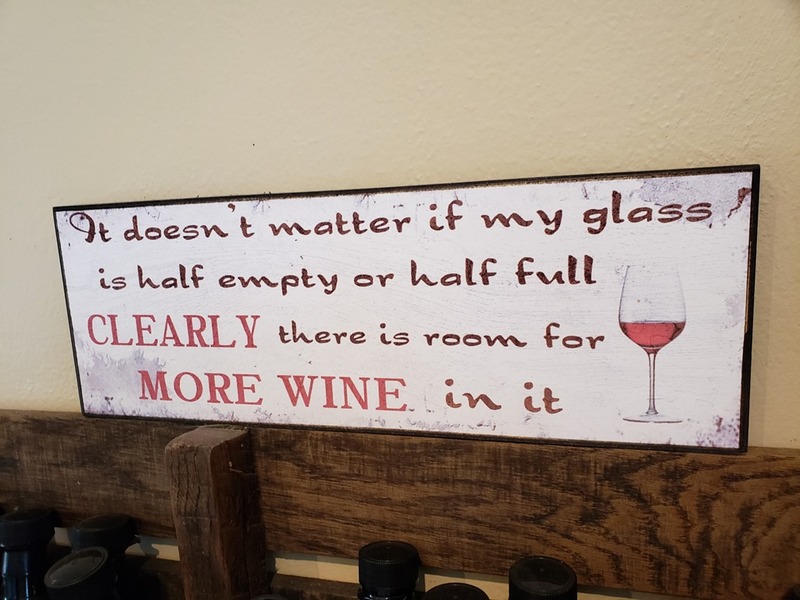 Below is Gloria and I talking…. We were tired so I voted to go out to dinner at a German Restaurant. Bob was not hard to convince, so I texted Linda and Mike and they had the same plan. We picked them up and off we went into town. The restaurant we chose was open Wed to Sun, but we found that they were closed. The sign said Sun, 11 to closing. We were not the only folks there! So we turned around and went to another restaurant where we had a great meal with wonderful friends! Monday- More rigs arrived today. The pre-rally starts on Wednesday, so it is going to be a busy week with rigs arriving. We went to Walmart and had a quiet day until the 4 pm happy hour. Tuesday- I had told Bob that as soon as we arrived for the rally, my editor was going to send me articles to update. Sure enough, the email was there with a list of 11 articles. I printed out the list, and did some other tasks. I unexpectedly received a PM from my niece, Stormi. She said that her dad has cancer and has gone downhill in the last 6 weeks. We knew he had been diagnosed with cancer, but had not known any more. Stormi and I sent PM’s back and forth. John, who is Bob’s older brother, age 69, had a lung tumor which had been the size of a pea about 6 weeks ago. Now it was the size of a grapefruit. He also has metastasis to his liver. Bob and I discussed what to do. Finally we decided that Bob would fly to Kansas City from Austin. The airport is 1 hour and 40 minutes away, but the airport is smaller and we hope there is less traffic than in San Antonio. So we made preparations for him to leave. We went to the social time at 4. We ate dinner at home. Wednesday- We left and drove to Austin. I dropped Bob off at the Southwest airline terminal area. Then I went to Costco. I picked up a few items, then stopped at McDonalds for a quick lunch. I arrived back at the rig at 1:30, just about the time Bob was landing. I stopped in the rally room and picked up our pre-rally packet of info. At 5 I went to the social hour. The we had the Welcome Dinner. To chose the order of the tables, they had us doing a puzzle. We were all seated by the year of our coach. Ours is 2004, but there were only two other people at the table, Dave Volker and April Zvan. We were in the corner, in the dark. So Dave held up a phone with the flashlight on. 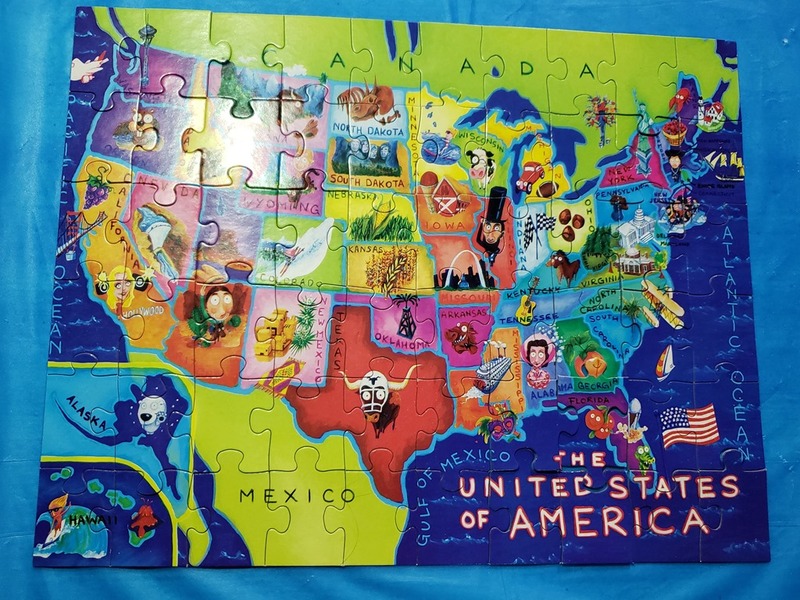 April and I worked on the puzzle. They had awesome brisket and turkey which we later found out was catered by Backwoods BBQ. Bob had gotten his rental car and checked into his motel. He went to Leavenworth to have dinner with his younger brother, Joe and niece Brandi. Thursday- There was coffee and doughnuts in the morning. 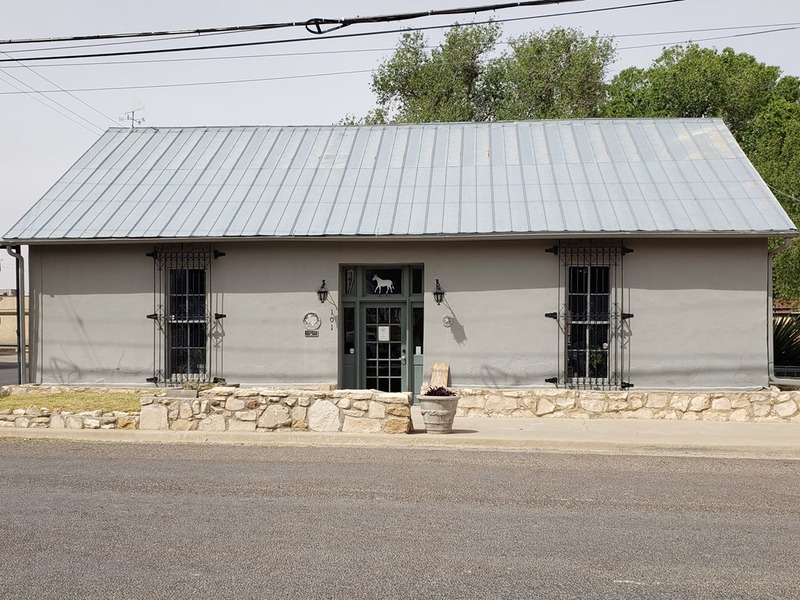 Some people went to the Kerrville Western Art Museum. I went to Walmart! Bob was able to visit with his brother for about an hour. He is very weak and not able to talk for very long. 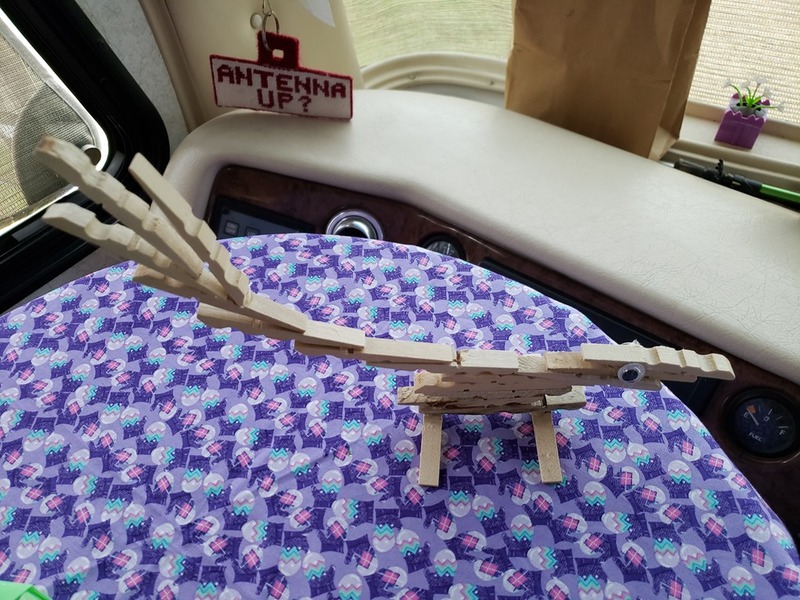 In the afternoon, I went to the craft which was making a clothes pin Roadrunner. We had social hour and dinner. Linda has been helping me walk the dogs. Friday- Bob sent me a text that they were in crisis mode. His SIL ended up in a hospital overnight and had called him to stay with John. So he raced over there. A little while later, Bob texted that John had become lethargic and had an abnormal heart rate, so he called 911 and sent him to the University of Kansas Medical Center. Bob locked up and followed to the hospital. He called his niece, Stormi, John’s oldest daughter, and re-routed her to the hospital. The Doc’s did have him sign a DNR. 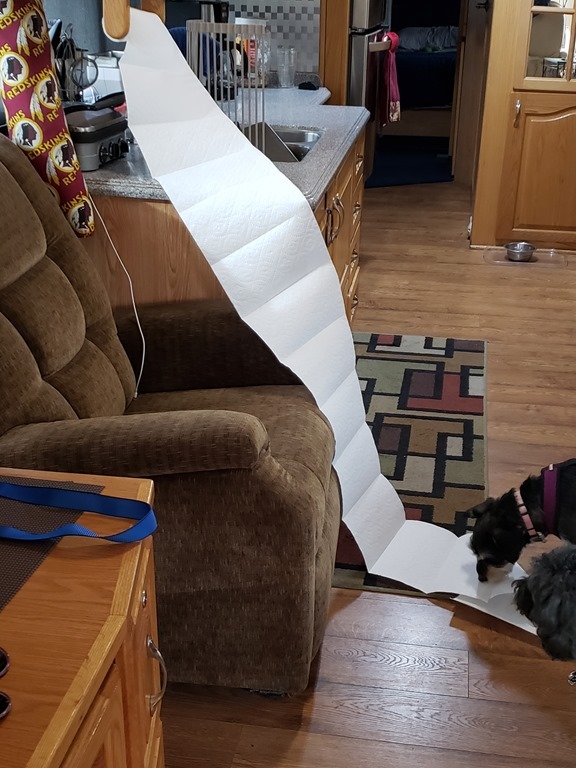 There is no other paperwork in place. I had sent Bob a long email with information on what he needs to do. He had forwarded it to Stormi so that she knows what services are available in the area. He is a Veteran, so he has been seen at the VA center in Kansas. Bob spent the day with John in the hospital. 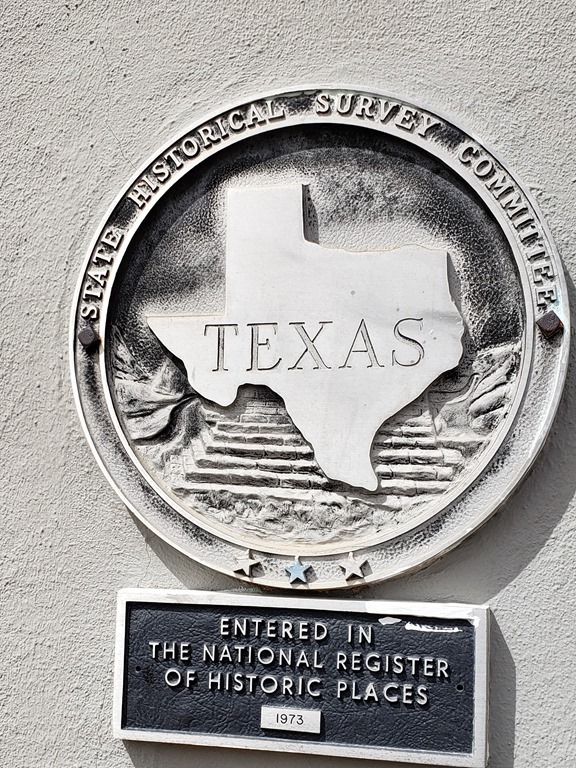 I went downtown and walked one of the blocks in Fredericksburg.